This page contains a sample of some of the information that we have discovered from looking at the TCU code. For more detailed information, click on the Analysis link in the TCU ROM images section. Thanks to TomsSVX for extracting these addresses using his Select Monitor and an Eavesdrop Cable. These are the addresses that should be entered into your datalogging software. Your datalogging software must have TCU support. Reading these addresses from the ECU will not give meaningful results. These extra addresses were found by inspection of the TCU program code. The shift plan is composed of multiple shift maps. There is one shift map for each possible combination of mode, stick position, and current gear. Each shift map is comprised of an upshift curve and a downshift curve. As an example: The UK TCU has 6 modes (Normal, Economy, Power, Manual, Cruise and Overheat). There are 4 stick positions (D,3,2,1) and obviously 4 gears (1st,2nd,3rd,4th). Therefore there are 6x4x4=92 shift maps in the shift plan. Suppose you are driving in Normal Mode, with the stick in D, at 50mph and 40% throttle. The gearbox is in 3rd gear. Imagine a dot at (50,40) on the 3rd gear map (the one on the right). If you floor the gas, the dot will move vertically up the chart. When you get to about 88% throttle, the dot crosses the downshift curve and the box changes down to 2nd gear. Now the dot is on the 2nd gear map at 100% throttle and moving right as the speed increases. When you reach 85mph the dot crosses the upshift curve and the box changes up to 3rd gear. You will note that the gear1-downshift map is a horizonal line at 100% throttle, because obviously we can't downshift from 1st gear. Similarly, the gear4-upshift map is a horizonal line at 0% throttle because we can't upshift from 4th gear. 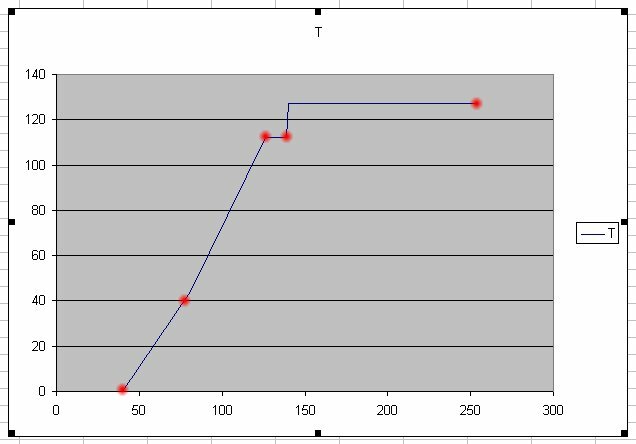 If you compare the Power mode curves below, you can see that in Power mode the TCU upshifts at a higher speed, and needs less throttle push to trigger a downshift. At 60% throttle it will change from 2nd to 3rd at 64mph in Power mode compared to 43mph in Normal mode. If you squeeze the gas pedal at 50mph in 4th, Power mode will downshift at only 35% throttle whereas Normal mode requires 62%. The USDM TCU is a little more complex than the UK version. It has 7 modes (Normal,Power,Manual,Cruise,LowPres1,LowPres2,Overheat) and therefore 7x4x4=112 maps. The LowPres1 mode is activated when the atmospheric pressure is low. The LowPres2 mode is activated when the atmospheric pressure is very low. The TCU uses power mode if the atmospheric pressure is very very low. I have no idea why Subaru would need different shift maps based on atmospheric pressure. Perhaps to compensate for reduced engine power at altitude? Only the USA model has this feature, the UK and JDM don't even have a pressure sensor. There is a FAQ on the SVX forums, "What does the manual button do?". Below are the maps for Manual Mode with the Stick in 3. You can see that the car will start in 2nd but then upshift to 3rd almost immediately and then hold 3rd right up to 143mph. On the downshift, it will hold 3rd all the way down to almost a standstill. Similarly, when the stick in is 2 (not pictured here), the car will start in 2 and hold it right up to 91mph. Essentially, Manual mode does its very best to keep you in the gear you have selected on the shifter. It appears to me that the UK Economy mode is slightly more relaxed than the JDM Normal Mode while the UK Normal Mode is slighly more aggressive than the JDM Normal Mode. ie. The JDM Normal mode is inbetween UK Economy and Normal. The UK Power mode is also more aggressive than the JDM Power mode. Below is a comparison of the UK, JDM and USA models in Normal Mode with the stick in D. When looking at this diagram it is important to remember that the USA model has a higher diff ratio and therefore lower rpm at the indicated speeds. I have extracted the maps into a big Excel spreadsheet. This can be downloaded from the Download page if you want to have a closer look at it. Open the file in a hex editor and scroll down to address 0xCFAD. This is a list of 16 bit pointers to the maps. ie. It holds the start address of each map. The first map is at location 0xD16D, the second at 0xD17C, the third at 0xD17F etc. This should give you a Map number between 0 and 223. The Pointer address is 0xCFAD + (Map Number * 2). T is a TPS signal between 0 and 127. Zero represents no thottle, 127 represents full throttle. In the graphs above, I have converted this figure to a percentage. Converted to a percentage (73*100)/127)=57% thottle. To put it another way, if you are accelerating at 57% throttle, the car will upshift from 2nd to 3rd at 100km/h. Torque Converter lockup is controlled by maps in a similar way to gearshifting. There are 52 maps in total: 3 modes (Normal, Power, Overheat) multiplied by 4 stick positions ("D","3","2","1") multiplied by 4 gears ("1st","2nd","3rd","4th") makes 48 plus Cruise mode in 4 gears = 52 total. Each map has a lock curve and an unlock curve. 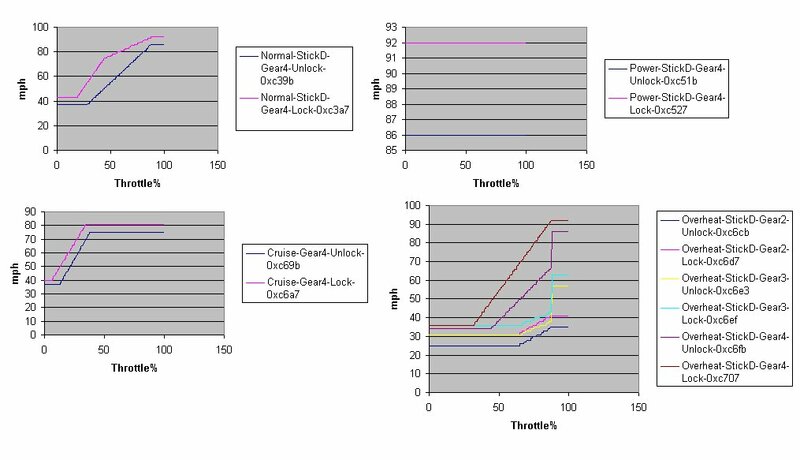 The TC will be locked when the speed rises above the lock curve and unlocked when the speed falls below the unlock curve. The x scale is tps and the y scale is speed. This is the opposite way around the the gear shift maps earlier in the thread. I have converted the scales to a percentage and mph for the picture below. Most of the maps, for example 1st,2nd and 3rd gear are a straight horizonal line at 159mph. This effectively means "do not lockup the torque converter" because the car is unlikely to ever exceed 159mph in those gears. The picture below shows some of the maps from a USDM TCU. The top left map is Normal-StickD-Gear4. You can see at 50% throttle, the TC will lock as you accelerate past 77mph and unlock as you decelerate past 55mph. If you were drag racing at 100% throttle, it would lock at 92mph on the way up and unlock at 86mph on the way back down. It has been mentioned in the "Power Mode Mod" thread that the TC does not lockup in power mode. This is not entirely true. As you can see from the top right map: In 4th gear, it will lock at 92mph and unlock at 86mph in any throttle position. In the bottom left corner you can see the cruise map, the TC locks up at lower speed and lower throttle for smooth driving and economy. Finally, in the bottom right corner is a sample of the overheat maps. When the TCU is in overheat mode, it locks up the TC even in 2nd and 3rd gear, not just 4th like the other modes. It has often been said that the TC generates a lot of heat. When the transmission gets too hot, the TCU locks it up whenever possible to try and stop the temperature from rising any further. In order to decode them, first find the list of thirteen 16-bit pointers at address 0xC339 in the USDM TCU. These contain the addresses for the maps for Normal-StickD, Normal-Stick3, Normal-Stick2, Normal-Stick1, Power-StickD, Power-Stick-3, Power-Stick2, Power-Stick1, Cruise, Overheat-StickD, Overheat-Stick3, Overheat-Stick2, Overheat-Stick1. where gear = 0 for "1st", 1 for "2nd", 2 for "3rd", 3 for "4th"
direction = 0 for "Unlock", 1 for "Lock"
The pointer for Normal-StickD is 0xC353. where t is the throttle postion and M and C are taken from the corresponding row of the table above. For example, if the throttle position is 40%, t is 102. Select the 2nd row of the table, M=0xC8, C=0x21. The speed is 112km/h which is 70mph.